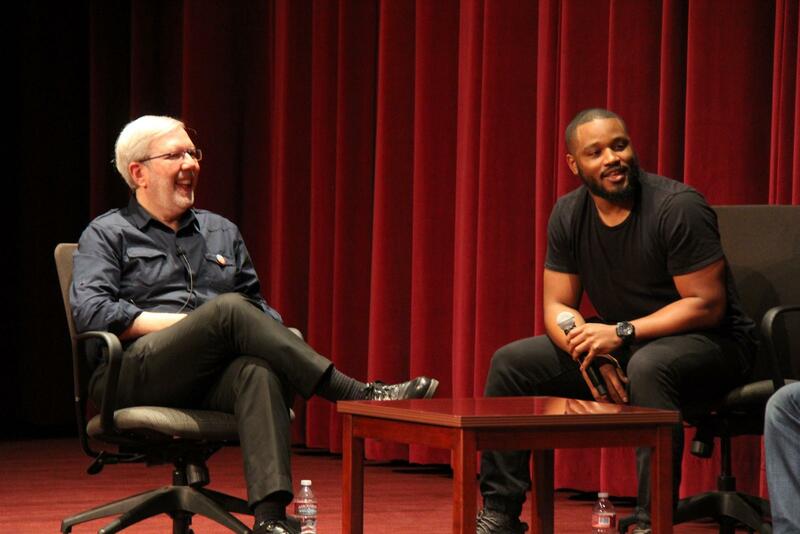 On Thursday, December 3, Leonard Maltin’s popular Theatrical Film Symposium hosted a special screening of Creed, the latest film from writer/director and SCA alum Ryan Coogler (MFA 2011). Coogler wasn’t the only returning Trojan. Joining him for a round of Q&A after the screening were his collaborators on Creed: co-writer Aaron Covington (MFA 2011), editors Claudia Castello (MFA 2011) and Michael Shawver (MFA 2012), and composer Ludwig Goransson (USC Thornton School of Music). They had all started working together as students and many played the same roles on Coogler’s first film, the award-winning Fruitvale Station. Perhaps the night's biggest surprise, however, was the presence of Creed producer and co-star Sylvester Stallone, who was greeted with a standing ovation from the audience. 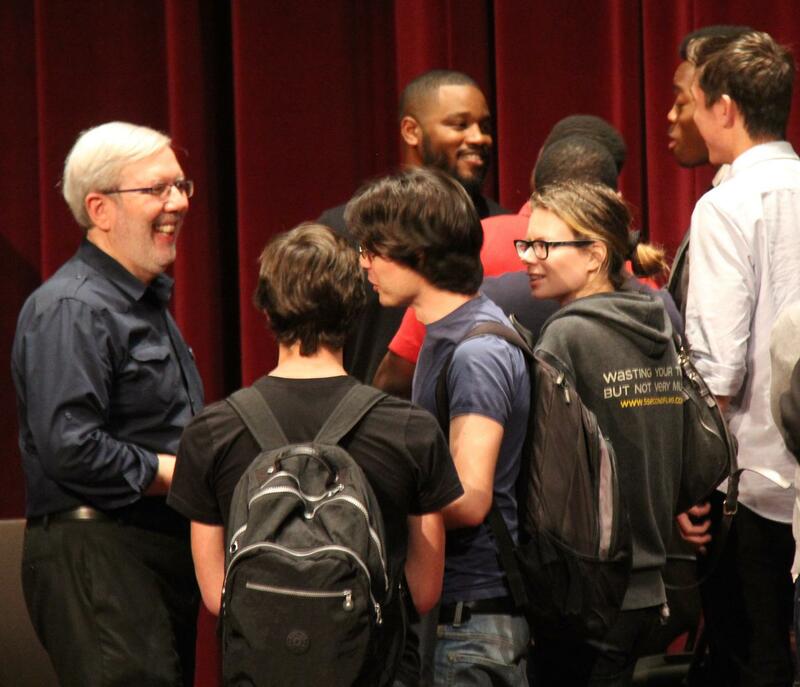 Together, the group talked to Maltin about working on their reincarnation of the iconic Rocky series. Coogler had the idea for Creed just before he went into production on Fruitvale Station. True to the original series, the film is an underdog story that chronicles the emergence Adonis, the son of Rocky’s other iconic character, Apollo Creed. Adonis is trying to establish a legacy of his own, away from the shadow of his father’s illustrious career in the boxing ring. The evening’s Q&A began with Coogler commenting on the hype around the film, with Maltin asking if the young director experienced any intimidation working with such an iconic cinematic character as Rocky himself. “No worries,” said Coogler jokingly at first. “But look at the shoes we’re trying to walk in,” he added, gesturing to Stallone, who was sitting beside him. Coogler described the working relationship with Stallone as “a constant collaboration.” However, he added that Stallone encouraged the young filmmakers to bring their own interpretation to the series. “He wanted us to make this our own—everything came from that perspective. He was always saying, ‘I want it to be a Millennial generation story. This is Adonis’ story. I want to see it from that perspective.’” Coogler, in very much the same fashion as the title character, is establishing his own vision of the series, while still paying homage to the original movie. With almost forty years of experience with Rocky, Stallone, who wrote every other installation of the series and directed all but the first, was invaluable to getting the film made. 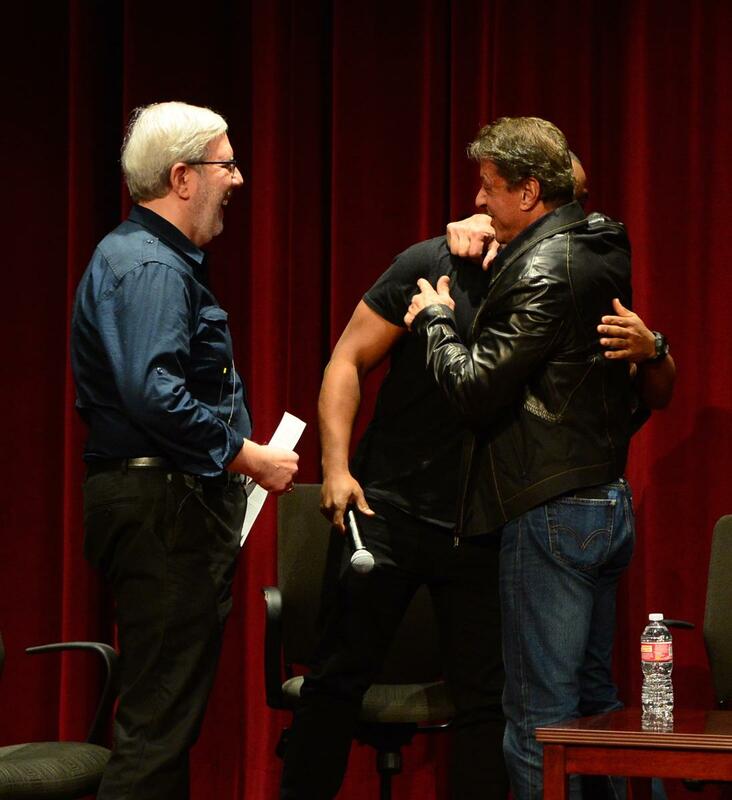 Stallone said he agreed to the collaboration after seeing Fruitvale Station, and felt that, with Coogler, the Rocky franchise was in good hands: “I give these young people a lot of credit for bringing it back to what I felt like doing Rocky One and just keeping it very real.” Based on Creed’s performance so far at the box office—$65 million domestic over just two weeks, despite debuting alongside the final installment of the Hunger Games series—the franchise has indeed been given new life. An important part of the Rocky lore is, of course, the iconic theme song “Gonna Fly Now,” composed by Bill Conti for the first film. The original plan was that Creed would use all original music. However, when composer Ludwig Goransson’s first score failed to match the climactic tone of the film’s pinnacle fight he realized the scene (and therefore the film) would be incomplete without a proper ode to Conti’s enduring composition. Goransson surprised Coogler with the substitution. “I knew the music better than I knew the movies,” said Goransson of the choice. He and the other USC alums ended the night surrounded by students who were glad they had come home, and were eager to hear anything they had to say about their amazing sprint from student life to Hollywood success.